“On Tuesday afternoon Mrs. L. J. Christler entertained at the rectory on Third avenue in honor of Mrs. James Sherry. The occasion being in the form of a pre-Lenten dinner to a number of Mrs. Sherry’s friends in commemoration of her birthday. The affair was a complete surprise to Mrs. Sherry. “The dining room was tastily decorated with hearts and flowers and valentine favors. The place cards used with importations from the Netherlands. The following notice greeted the guests as they entered the dining room: “This Birthday Feast is by Permit of the Chief Food Administrator”. “The tables were profusely decorated with red Carnations and were distributed to the guests. Mrs. Sherry was the recipient of many hearty birthday wishes and other tokens of esteem to make the event one long to be remembered. “An annual event, which is looked forward to with a great deal of pleasure among the members of the Bridge club, occurred on Thursday afternoon and evening when the four ladies holding lowest scores for the year entertained those holding highest scores. “In the afternoon the hostesses escorted their guests to the Orpheum theatre where the program was enjoyed by all and in the evening an elaborate eight o’clock dinner was served at the home of Mrs. C. F. Morris. “Valentine decorations were used throughout the rooms and for the table. “The hostesses were Mrs. C. F. Morris, Mrs. D. S. MacKenzie, Mrs. C. B. Wilson, and Mrs. A. J. Brodrick and their guests were Mrs. W. F. Hamilton, Mrs. J. A. Wright, Mrs. H. S. Kline, and Mrs. V. R. Griggs. “On Monday afternoon Mrs. R. M. Rathbone entertained a few intimate friends for Mrs. Matt Ferguson, who expects to leave soon for her new home at Salt Lake. It was also the hostess’ birthday and she was the recipient of congratulations and best wishes from all. Cut flowers were used for decorations and a dainty menu was served. “Those present were: Mrs. Matt Ferguson, Mrs. Jim Ferguson, Mrs. F. O. Black, Mrs. Josephs, Mrs. Healey, Mrs. Olson, Mrs. Hayes and Mrs. Daviscourt. “Mrs. M. Bakula was hostess to a few friends on Friday afternoon. Knitting and conversation occupied the hours and at five o’clock luncheon was served. The guests were: Mrs. F. O. Black, Mrs. R. M. Rathbone, Mrs. C. S. Hanson, Mrs. G. Christiansen, Mrs. A. E. Wilkie and Mrs. Vanderhort. “The Sherry’s Give Card Party. “On Tuesday evening of this week, Mrs. And Mrs. James Sherry gave a card part to few of their friends at their home on Sixth avenue. “We are willing to do all we can to help the farmer grow more crops to feed the boys at the front. Live and let live, we want your business after the war. Buy from Shepard Bros. same price to everybody. 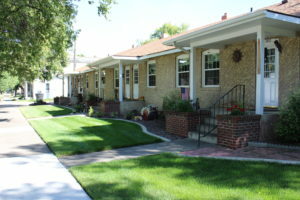 The Lucke Apartments are located on the southeast corner of Second Avenue and Sixth Street. As a special bonus to this blog, here is a picture of the Lucke Apartments.